Photo by That Boy, from the Torontoist Flickr pool. The moment the story broke that Mayor John Tory wanted to end carding was a special one. It was clear the scales had fallen from his eyes as he made the announcement that he would seek a “permanent cancellation” to police carding in hopes that the city could “start fresh… working together befitting a safe city that is a model to the world in respecting diversity and building a bias-free community.” The mayor’s words mark a lofty ambition, to be sure, and one that won’t be possible if a few lessons aren’t learned from this fight. I’m familiar with most of the personalities on Tory’s team, and they are, for the most part, good people with good intentions. But good intentions count for nothing when the outcomes are consistently bad. From transportation planning and budget fiascoes to bad policing practices, Tory’s team has too often set him toward tilting at windmills. On the issue of carding, they were not only dead wrong, but arrogant about it. For example, Mary Anne Chambers, a former Ontario Liberal cabinet minister and revered figure in Toronto’s black community, was asked by an unnamed Tory staffer why it seemed only black people were opposed to carding. Staggering ignorance aside, this is not the level of community relations John Tory promised during his campaign. His name is attached to the One Toronto logo, and he needs to start living up to that mantra. Opposition to carding and police street checks is not new. Not by a long shot. The Black Action Defense Committee, formed in response to a slew of black men shot dead by Toronto police, has been with Toronto since 1988. Dudley Laws, Charles Roach, Lennox Farrell, and Sherona Hall had each dogged past mayors, police chiefs, and police services board meetings for decades. Advocates like Akua Benjamin, Zanana Akande, and Dr. Grace-Edward Galabuzi have spent the better part of their lives suing for the humanity of black Torontonians. If Tory wished to avoid getting mired in this PR nightmare, he would have spent more time with advocates from Toronto’s communities of colour, processed their concerns, and taken their word for it that carding is a toxic and divisive practice. With his troubled history of misunderstanding privilege, and by giving more weight to his staff, Chief-Designate Saunders, and Toronto Police Association president Mike McCormack, Tory unnecessarily cast himself as yet another privileged and out-of-touch mayor incapable of dealing with the needs of a diverse city. Even Rob and Doug Ford understood this instinctively. To avoid messes like the carding fiasco in the future, Tory should reconsider using a single go-between to Toronto’s communities of colour, and give more thought to diversifying his staff. It shouldn’t take a crowd of rich, connected, white ‘eminent Torontonians’ to turn the tide on our community issues. In his speech, Tory explained his initial intent in supporting carding was to “give the process time to bring forward a new and better way of addressing police-community engagements and delivering on our universally shared goal of bias-free policing.” Let’s assume for a moment that bias-free policing is even possible, given that bias-free humans do not exist. There was actually a blueprint new and better way for community policing available to Tory, all but wrapped up with a bow tie. 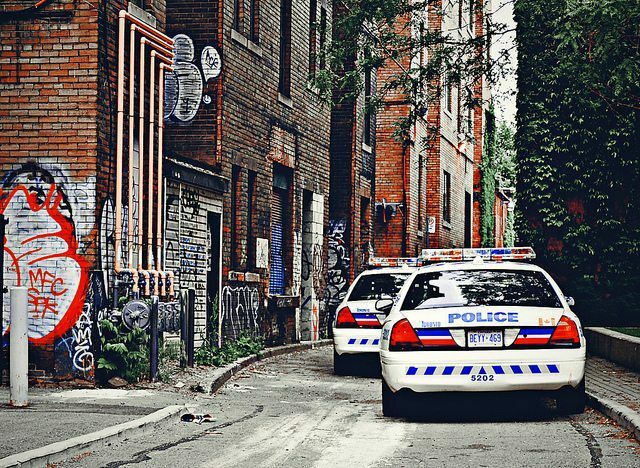 The 2013 Police and Community Engagement Review (commonly known as PACER [PDF]) not only addressed many of the past difficulties that residents of colour have had with Toronto police but gave 31 richly detailed recommendations for improving those relations. It was constructed not only under the guidance of Deputy Chief Peter Sloly, and then Deputy-Chief Saunders, but a range of community activists who stuck their necks out to help our police do their jobs better. Among those recommendations are equipping all officers with body cameras, taming the cowboy tendencies of TAVIS officers, and a limit of seven years for holding data collected through carding. Since the release of the PACER report, it seems to have gotten more use balancing the underside of Chief Saunders’s coffee table than for addressing community engagements. Tory should consider printing a copy and leafing through it before the next police board meeting on June 18. Given the history of police abuses in Toronto, and the mulishness of both Chief Saunders and the Toronto Police Association, there will never be a “fresh start” to this issue. Too much damage has already been done. But using the PACER recommendations as a way forward could at least begin to clean up the toxic mess that community policing has become. Last week, Police Services Board chair Alok Mukherjee was similarly struck blind, experiencing his own Road to Damascus moment. While attending a Know Your Rights panel (with Desmond Cole, no less) young people in the audience were asked whether they had been carded. Every black child in the audience raised their hand. Not long afterwards, Dr. Mukherjee was riding public transit when a black teacher engaged him in conversation, and told of the dehumanizing experience he’d had during a police street check in the 1970s. In a lengthy article that was half-manifesto, half-mea culpa, Dr. Mukherjee insisted that information from residents stopped by police “not related to any criminal investigation or likelihood of a criminal investigation not be recorded in any police database.” This is a right-minded request, but it doesn’t go far enough. Disallowing non-pertinent information from new police encounters does nothing for those children in the audience, or for the teacher who bravely engaged Dr. Mukherjee in that conversation. When one of those youth apply for a summer job, or try to volunteer in their community, their criminal background check could still flag them as known to police. If that teacher had been a recent teacher’s college graduate stopped in the last 8 years, rather than a veteran teacher stopped in the 70s, that encounter could have been a career-derailing obstacle. Information extracted from residents for carding purposes is not “voluntary” when the person asking for that information is holding a gun and a badge, and prone to violence when refused. When Torontonians of every stripe were swept up in Project Safe City and asked to give up information on their firearms, the city all but revolted. Now, we’re looking at millions of contact cards gathered from hundreds of thousands of Torontonians, containing personal information (likely recorded incorrectly) obtained under duress. To date, Toronto Police still have not provided any examples of criminal convictions that stemmed from carding. Without a solid and compelling case for holding on to this data, they need to get rid of it. It was never theirs to take. This isn’t a recommendation for Mayor Tory. It’s for Toronto’s news media, whenever we have a conversation like this one in the future. Let’s not kid ourselves that the conversation on carding was completely symmetrical. On one hand, there are organizations like CAPP, the Policing Literacy Initiative, Network for the Elimination of Police Violence, and the Jane & Finch Action Against Poverty that have produced reams of reports [PDF] and heartbreaking testimony over the years to scrap carding. They’ve spent much time and effort, often at personal cost, to develop a new model of policing that puts more weight on community relations and mutual cooperation. On the other hand, there are the pro-carding advocates. Feckless and underinformed journalists who function more effectively as stenographers, the head of the Police union who seems to have forgotten that Toronto residents don’t answer to a chain of command, and anonymous sources who seem to believe the words “anecdote” and “evidence” are synonymous. The pro-carding side has been completely outmatched. If Christie Blatchford, for example, believes she has an important take on carding, she should have to do more heavy lifting than exploiting the murder of Cecilia Zhang to tell Toronto why its brown and black population should be expected to forfeit their Charter rights. In the future, news organizations need to demand at least as much evidence from the police’s cheerleaders as community advocates are continuously forced to provide. There’s no reason Desmond Cole should have to bare this much about himself and his humiliating encounters with police while anonymous former detectives can comfortably sit down and tell campfire stories to journalists and be taken seriously. This isn’t a debate over tax policy or transit accessibility; it’s a conversation on our fundamental human rights. This conversation was far too easy on carding advocates, who knew full well they weren’t putting their personal information and private lives at stake. We can look back at this conversation, and celebrate the fact that Toronto’s conscience finally won out over prejudiced assumptions and bad policy. But to avoid this happening again in the future, both Mayor Tory and our press need to rely on better people. Andray Domise co-hosts the Canadaland Commons weekly podcast.